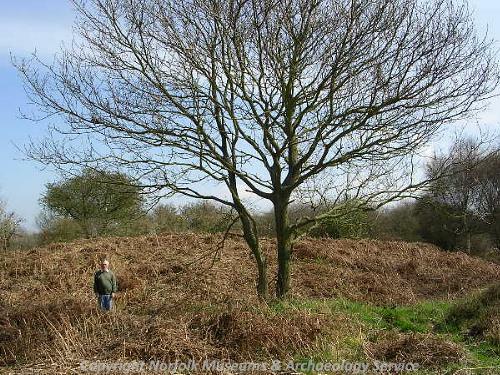 A large Bronze Age bowl barrow with an outer bank, situated on Salthouse Heath is visible on 1946 and 1994 aerial photographs, and is one of the largest and best-preserved barrows in the county. 21m (70 feet) diameter, 1.8m (6 feet) high surrounded by bank and double trench. Small broken urn 10cm (4 inches) high alone found. (S1) describes this as a bank in the shape of a 6 with entrance towards the sea and a central mound. Section by R. R. Clarke (NCM) shows banks 30cm (1 foot) high (that on east destroyed), mound 1.8m (6 feet) high, ditch 45cm (1 foot 6 inches) deep; from west, marked as '17 feet to edge of ditch, 30 to far side ditch, 108 to far side mound, 121 to far side further ditch, 138 to far edge east bank'. Dimensions confirmed. Gorse covered on heath. The urn was found 'somewhere near the surface of the mound' and 'has a kind of chevron pattern scored on the rim'; apparently lost. A. J. Lawson (NAU), 30 January 1976. Good condition, low bracken. Outer bank burnt bare on northwest. Schedule gives as 2m high, 25m across, ditch 4m wide. Large bowl barrow centred on TG 0774 4215 and measuring 25m in diameter, with an outer bank 5m across, visible on 1946 RAF aerial photographs (S7) and Ordnance Survey aerial photographs from 1994 (S8). A ditch separates the two and is approximately 2-3m wide. This monument is likely to be Bronze Age in date, however it may be early in the period. It is morphologically very similar to the largest mound of the NHER 6201 group to the north east. S. Massey (NMP), 19 December 2002. May 2003. Field observations. NGR obtained by GPS; TG 07744 42167. Good condition. Hints of a slight external bank. 2009. As part of the 2009 Salthouse Sculpture Trail, a local artist created an avenue between this monument and 6203 (which are intervisible). Entitled 'Brush with Nature', two lines of markers made from the debris of recently-felled trees and saplings form an avenue between the two mounds. This was inspired by Neolithic stone avenues such as can be seen at Carnac in France and Aylesbury in England (S9). D. Gurney (NLA), 24 August 2009. --- Photograph: HQ 1-2, BZP 8-10, CXV 8-10. --- Aerial Photograph: TG0742 A-D,Q,R. --- Archive: Ordnance Survey Staff. 1933-1979?. Ordnance Survey Record Cards. TG 04 SE 16 . <S1> Serial: Bryant, T.H.. c.1900. Norfolk Churches..
<S2> Article in serial: Chester, G. J.. 1859. Account of the Discovery of Ancient British Remains, Near Cromer. Norfolk Archaeology. Vol VI pp 263-267. pp 263-267. <S3> Monograph: Lawson, A. J., Martin, E., Priddy, D. and Taylor, A. 1981. The Barrows of East Anglia. East Anglian Archaeology. No 12. <S5> Scheduling record: Corbishley, M.. 1983. AM107. <S6> Article in serial: Chester, G.J.. 1850. Archaeological Journal. p 392. <S7> Vertical Aerial Photograph: RAF. 1946. RAF 106G/UK/1571 3166-7 07-JUN-1946 (NMR). <S8> Vertical Aerial Photograph: Ordnance Survey. 1994. OS/94172 027-8 14-JUN-1994. <S9> Verbal communication: Judith Campbell. 2009.